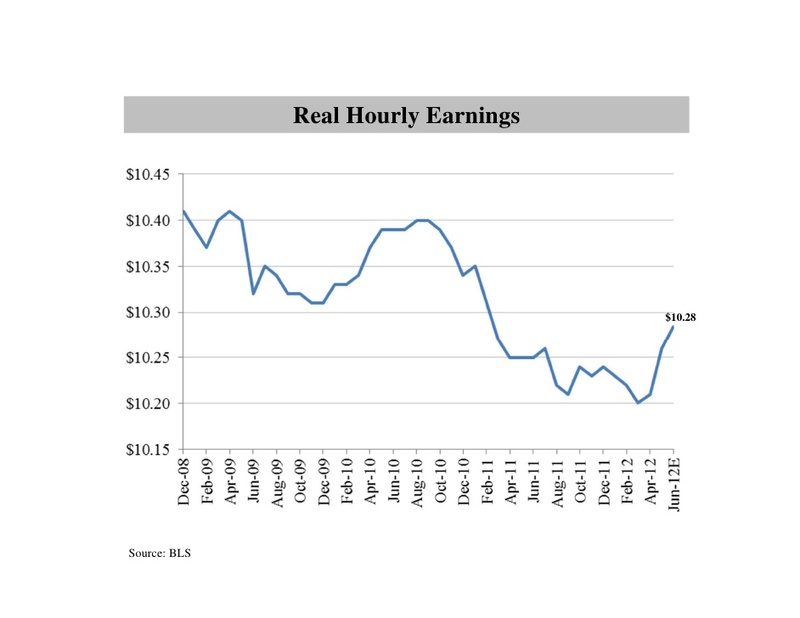 Morning Joe: Hours worked, wages increase in June jobs report. If you read this blog on even a semi-regular basis by now you are probably aware that I am a fan of a man name Steve Rattner (Twitter, Wikipedia). He is an economist/financier (who was actually the car czar in charge of the automobile bailout). Rattner is very helpful to a person like myself who looks for information that hopefully supersedes politics (as can be seen by him and Mika joking about Elizabeth Warren due to Rattner being a democrat who supports her republican opponent to be a United States Senator from Massachusetts). These graphs show a lot of interesting information, but what is said about them on the show helps make a lot of sense of the information actually trying to be addressed. So, feel free to click the link at the top of this post to go to the video, or you can read the text of their conversation. How would you characterize the numbers? Bad, dismal? Certainly worse than we expected and better than we feared. We had to previous pretty bad months. I think people were hoping for over 100,000 jobs this last month in June and we got 80,000 jobs. It was a disappointment, but I think people are accustomed to the fact we’re in a slow growth. Is there any growth in specific sectors? Yeah, that’s part of the issue though. When you break it down by sectors you see a varying pattern that helps explain why things are sluggish. 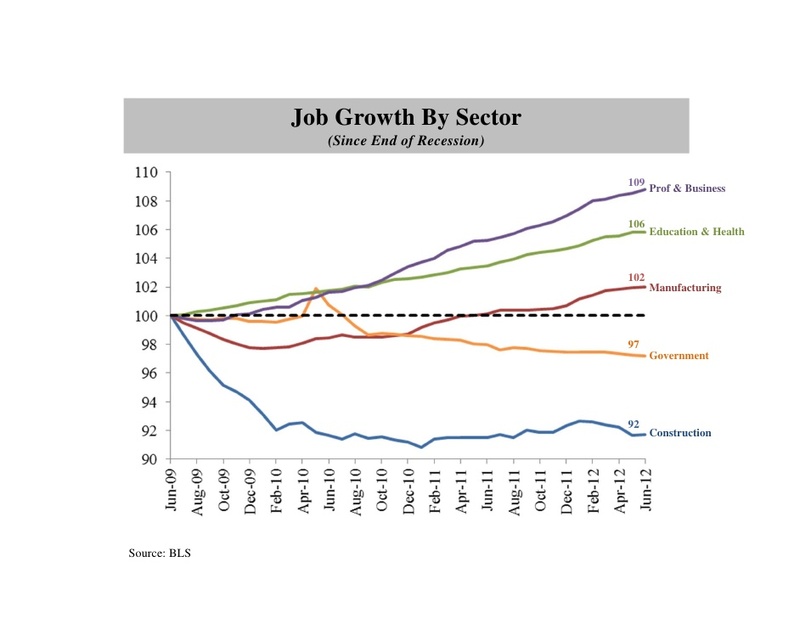 If you look at this chart you’ll see, going back to the beginning of the recovery, sectors like professional and business services, education and health, have grown very significantly and, in fact, are now at or above their pre-recession levels. You hear a lot of talk these days about manufacturing, which is growing again, although not back to where it was before the recession started. But here’s a point that we’ve discussed before that’s very important. You’ve got very, very large sectors like government, like construction, which you can think of as home building that are still down in the doldrums. Look at construction which had no recovery even as there has been some recovery in the jobs, so that’s a big part of the problem. You’ve got roughly 30% of the economy where the jobs are simply not growing or including finance, media, a lot of very important industries. Construction? I would assume that a huge percentage of construction being off is related to the housing situation. Sure, that’s home building. Yes. 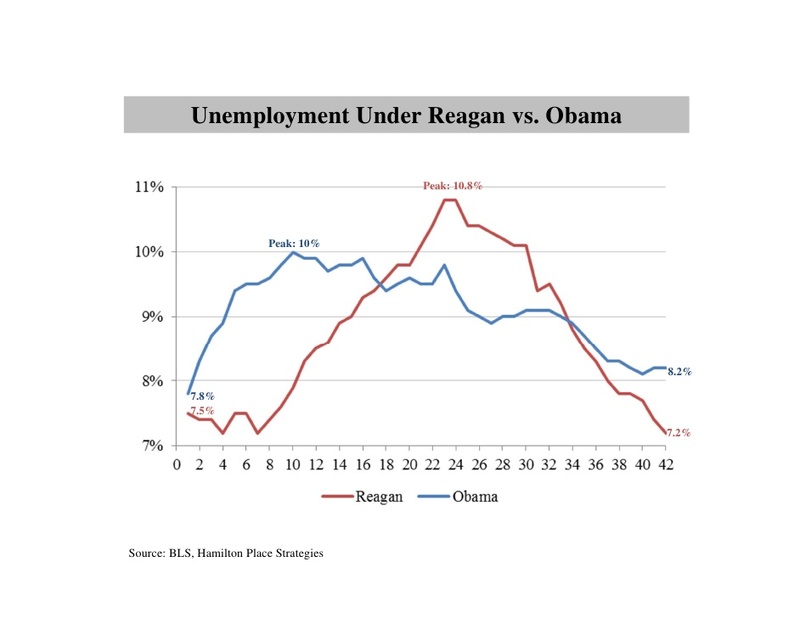 I thought that this chart was very interesting because it should be noted that with a steeper recession there is a steeper path to recovery, which I have blogged about before (click here if you’d like to read the post comparing President Reagan & President Obama’s recoveries). And this number might seem menial, but think of it like the analogy about the weakest link in the chain so as long as you can imagine that at least everyone who has a job in this country is a part of that chain.